Funny birthday wishes should have a sprinkle of "ha, ha," a dash of "truth in jest" and not a hint of sour grapes. That's exactly the mix of ingredients you'll find in the funny birthday messages below. 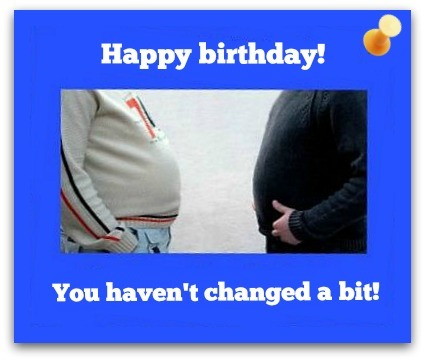 The idea behind sending funny birthday greetings is always to make the birthday girl or boy see the absurdity of wallowing in the self-pity that comes with getting older. It's not to insult or offend him or her. With this approach in mind, I've written funny birthday verses that are hilarious, but not at anybody's expense. Choose the one that you know will tickle the funny bone of your loved ones. Statistics show that people who keep celebrating birthdays live longer but eventually look worse than Keith Richards in the morning. Happy birthday! Can you blow out all these candles or should I call the fire department? Happy birthday! Count your blessings, not your age spots. Happy birthday! Happy birthday! You still have the face of an angel — not a day older than when you first bought it. Happy birthday. You know you're getting old when you lose count midway through counting the candles on your birthday cake. The only thing uncool about getting older is that all the things you thought were really lame growing up are super cool now. Golf, anyone? Happy birthday! Happy birthday! On your special day, make time to play in your birthday suit…but first make sure it’s clean, and wrinkle-free and doesn't smell weird. You can't pick your family, but you can pick your age. Happy 29th birthday, right? Keep searching for more laughter! Happy birthday, kiddo! You’ll know you’ve reached adulthood when your birthday cards no longer contain money. Happy birthday to a real wonder — someone who acts and looks younger than any person I know our age. I really hate you. Like really, really! Happy birthday to a person who is truly brilliant, incredibly gorgeous, unbelievably funny…and, quite luckily, has been blessed with my DNA. Happy birthday! Your skin is way too taut and firm for someone who's at least a decade past the age when most of us experience the dreaded pull of gravity. Happy birthday! You may not consider yourself over the hill yet but you have to admit you're starting to feel really woozy from the climb. Birthday candles? Blowing them out at your age is not a good idea. You might lose your dentures and knock someone out. Here’s to a safer birthday! Happy birthday! I wanted to get you something tremendous, something that just gets better and better every day, but I couldn't find a box big enough for me. Happy birthday to my oldest friend! Didn't we always say getting older would be a real gas? Well, we were right — excess gas and antacid tablets are the bane of our existence. It’s been scientifically proven that too many birthdays will loosen the skin just below your chin, making you look like Jabba the Hutt from Star Wars. Happy birthday!